Maureen lived in the country where there were rolling hills for as far as the eye could see. Each was carpeted with emerald green grass. Hundreds of sheep, white and wooly, nibbled on the tender blades. Maureen’s father spent his days tending to the sheep, herding them to and from the hills. During lambing season, he stayed out with them all day and night, to make sure the new lambs and mothers were well. Maureen’s mum spent most of her day in the croft house. She was always cooking something delicious such as barley soup, roasted mutton with mint sauce, bannocks, raisin scones, and tablet. Maureen thought her mum baked the best shortbread in the village. It was sweet and buttery. Maureen often took some in her pocket when she went out into the hills to play with the sheep. One sunny morning when Maureen was running about the hillside with some of the new lambs, she saw a patch of white flowers. She bent down and looked closer. They were daisies with white petals and lemony-yellow centers. Each petal had a few drops of dew on it, which shimmered and sparkled like beads of glass. Maureen picked a handful and sat down on a large, flat rock with her legs crossed. The lambs frolicked about her, exploring their new surroundings. She started to make a daisy necklace. She strung the daisies into one another until a chain had formed. She held it up and felt so proud. She slipped it around her neck, under her long reddish-brown hair. Maureen made another one and strung it about one of the lambs’ necks. It was hard to do because the lamb jumped about. It pounced about the grass with its necklace on. Maureen laughed. She picked a few more daisies and made some more necklaces. She strung them around all the lamb’s necks. She’d just finished making the last one when she heard her mum calling her for lunch. Maureen jumped up and ran through the grass towards the croft. All the lambs followed her, all wearing their daisy necklaces. When she got to the door, her mum was standing there watching and waiting for her. 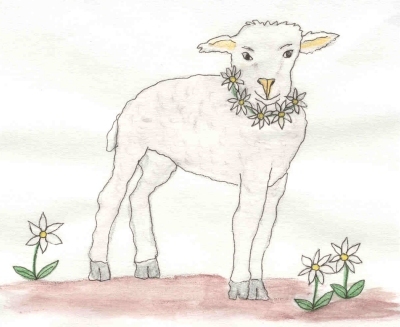 She started to laugh when she saw all the lambs with daisies around their necks. Maureen pulled another necklace out of her pocket. It was longer than hers and had a few shortbread crumbs on it. She handed it to her mum who put it around her neck. Leaving the lambs outside, Maureen went in to eat her lunch. She’d had a lovely morning.